Subscribe to a season package. Make new memories that will last a lifetime. Packages on sale May 23 – September 15 only. Click Below for Online Ordering Help. Every season package is custom designed by you to fit your tastes. Choose your own unforgettable performance lineup of shows from dozens of events. *Premier events, The Revolution and Louie Anderson, will not be discounted but count toward the number of package shows. 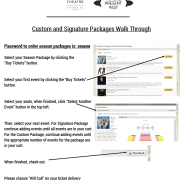 Some events produced by local partners, or other outside users, are not eligible as part of season packages. These include but are not limited to: Sheldon Brass Band Concerts, Arts Alive!, Red Wing High School Musical, and Strings, Winds and Brass. Save 10%, 15% or 20% depending on how many shows you order. The more you buy, the more you save. Priority Purchase Period May 23 – July 4, before seats go on sale to general public, to lock in your favorite seats. Season Package buyers pay only $1/seat in their package in order processing fees, saving you even more off single tickets.